With the William Jewell College Presidential Inauguration next month, the Hilltop Monitor decided to sit down with Dr. Elizabeth MacLeod Walls to reflect on her first year at Jewell and discuss her priorities for the future. MacLeod Walls is finding Jewell to be a good fit for herself and her family. “I knew before I arrived that it was a fit for my perspective, things that I valued, things that excited me, but I could not have known until I actually came into the role just how remarkable that fit was,” said MacLeod Walls. Prior to becoming president, MacLeod Walls lived in Nebraska, so she has visited Kansas City. Living in Liberty has offered her the chance to get to know the area even better. “Until you live here, you don’t experience all the wonderful cultural aspects of the city, so that’s been fantastic,” said MacLeod Walls. In addition to spending time in the city meeting community leaders and attending events, she has enjoyed experiencing the museums and events Kansas City has to offer with her family. “That’s a gift for all of us in the Jewell community and Kansas City, so I love taking advantage of that,” said MacLeod Walls. MacLeod Walls said her first impression of Jewell was that it was a place of originality and optimism. Over the past year, the College has worked on a rebranding mission to define its overarching philosophy and construct a marketing strategy. Both of these aspects played into her vision for this project. She described the process of identifying the philosophy as an optimistic exercise because it required looking to the future and understanding what Jewell does well. Originality also played a role. “What’s original about Jewell, I think, is the ethos of Jewell. We were not willing to just say it’s about critical thinking. Critical thinking doesn’t matter unless you are in community because that’s where original thought occurs, right? Because you can have an original thought on your own, but unless it’s shared with someone else, it never has meaning and never comes fruition so we value that a great deal here,” said MacLeod Walls. The brand mission team has identified Jewell’s philosophy. However, for MacLeod Walls a plan is no good if it is not carried out. “This is a long term idea that will give shape to everything that we do, but the beautiful thing about it is, it’s focused. So, what we heard from our constituents in the brand mission research process was great things about Jewell. The community loves Jewell. But the community could not identify the keys things that we do and say, ‘yes that has value.’ That’s changing,” said MacLeod Walls. From the brand mission came Jewell’s philosophy: “We are critical thinkers in community pursuing meaningful lives.” This academic year, the College will focus on carrying out and embodying this philosophy. Identifying this philosophy was not a simple task. It involved a lot of listening, which was one of MacLeod Walls primary focuses coming to Jewell. She learned significantly from her experience. She conducted listening tours across campus to hear the questions, concerns and issues facing the Jewell community. “What I asked of every single group were the same three questions. I asked, ‘What do you love? What are your challenges? What barriers are you experiencing that I might be able to help remove for you?’ And those three questions usually engendered about an hour’s worth of conversation from people because they were meant to just spark ideas and then other people would piggyback on those ideas and begin to share their views and it really was fruitful and educative for me that I was able to kind of piece together a patchwork of perspectives from the whole community and see it from lots of different perspectives. But, at the end of the day the commonality is, we love what Jewell stands for, we love what Jewell does and we want to see it thrive,” said MacLeod Walls. At the beginning of her term, MacLeod Walls said that diversity and inclusion on campus was to be one of her priorities. The College has worked to create a strategic plan for diversity and inclusion, which was outlined in a recent email from Dr. Andy Pratt, Vice President for Diversity and Inclusion. MacLeod Walls’ email at the beginning of the academic year, setting the tone for the year following events in Charlottesville, is a part of this plan. She wants to emphasize that Jewell believes in dialogue, difficult conversation and zero tolerance of hatefulness. “Hatefulness is always an effort to dehumanize someone else. It always is. That’s how I define it. So, as a campus community we need to be very open and honest about moments when we’re going to encounter hateful speech because we will,” said MacLeod Walls. Additionally, the plan includes a bias response team and an intercultural development inventory, which is a nuanced assessment that looks at an individual’s level of openness to difference and their overall cultural competence. This assessment was taken by faculty, staff and the Student Senate cabinet, who are now meeting with Dr. Pratt to discuss what the results mean for them as individuals. “This is a topic that creates emotion in people and also creates confusion and challenge. Luckily for us, we are a place that embraces ambiguity and really works through that, so I think there’s tremendous opportunity here for us to make meaningful progress in the area of diversity and inclusion,” said MacLeod Walls. 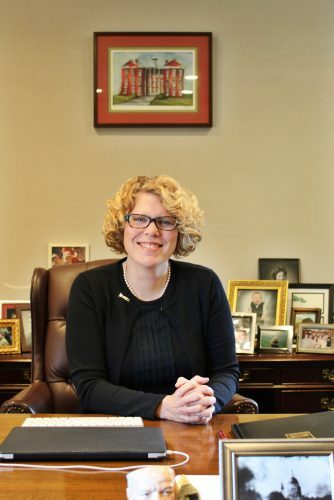 Only a year into her time as president, MacLeod Walls has listened to many faculty, staff and student groups, has worked to help identify Jewell’s philosophy and has helped create long term plans to improve the College. Her priority for this year though is to start the six year strategic plan. The goal is for Jewell to be recognized as an indispensable source of engaged critical thinkers in Kansas City. “If William Jewell got hit by a meteor right now, how would Kansas City react? So that’s my litmus test. Right now, I don’t like the answer to that question. Because I think that most of Kansas City would say ‘yeah, that’s a tragedy’ and then they would move on,” said MacLeod Walls. She cited the analytics of Kansas City area companies, noting that they evaluate their own employees on aspects such as adaptability, communication skills and creativity. Jewell graduates typically score well in these areas, which MacLeod Walls attributes to the critical thinking curriculum taught at Jewell. Students can learn more about this strategic plan by attending a session about it Sept. 18 during Jewell time in Yates-Gill Union 222. Finally, MacLeod Walls also mentioned residence life as a priority for the year, particularly renovations of structures in the first-year triangle, recognizing that the current structures may be a barrier to attracting prospective students. “It also, frankly, is not honoring our ethic of believing in community because they are just sort of spaces you can live in. They’re not fostering opportunities for connection and collaboration. So, if that’s an ethic for us, if that’s our philosophy, then we need to use that lens as were looking at the residence halls and start with the first-year triangle and say how can we make this better,” said MacLeod Walls. These priorities, along with the diversity and inclusion plan and continued listening, will keep MacLeod Walls busy as she starts her second year as Jewell’s president.